Bravecto Chewable Tablet for Dogs - Orange, For Dogs 9.9 to 22 lbs. Bravecto is a soft chewable that is given every 12 weeks. 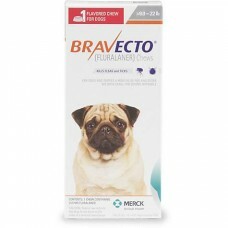 Bravecto kills adult fleas and is indicated for the treatment and prevention of flea infestations and the treatment and control of tick infestations (deer tick, black-legged tick, American dog tick, and brown dog tick) for 12 weeks. Bravecto also kills lone star ticks for 8 weeks.